For Redemption '13, over the weekend of 22-24 February 2013, we went back to the Britannia Hotel in Coventry. Our Guests of Honour this time were Virginia Hey and Kim Newman, and, although we were very slightly smaller than on some past occasions, it was a great weekend. You will find linkes to many members' con reports on the Redemption LJ community. Over the weekend of 25-27 February 2011, Redemption returned to the Britannia Hotel in Coventry. The Guests of Honour were Ben Aaronovitch and Simon Guerrier, and everyone had a fantastic time. Many members' con reports have been posted on the Redemption LJ community. Redemption '09 was held over the weekend of February 20-22 2009, at the Britannia Hotel in Coventry. The Guests of Honour were Paul Cornell, Rob Shearman and Kev Sutherland. The con was a great success, thanks to the guests, to the committee and other organisers, to all of the members - and also to the hotel staff, who delighted everyone with their friendliness and helpfulness. Brigade Leader Lethbridge-Stewart became the Ruler of the Universe, and Kev Sutherland's sock puppets made fans of us all. Redemption '07 was held over the weekend of February 23-25 2007, at the Hinckley Island Hotel. Guests were Scott Fredericks and James Swallow, and Dan O'Bannon managed an on-line web-chat with us on the Sunday night. The Ruler of the Universe competition created new branches of voting mathematics and political strategy, and the hotel staff imploded under the weight of white-tack and A4 posters. Redemption '05 was held over the weekend of February 25-27 2005, at the Hinckley Island Hotel, just outside Hinckley. The guests were Mat Irvine, Jim Mortimore and Jason Carter. This Redemption had a certain strangeness to it, being the first Redemption in a new hotel, and one that had only just changed owner (and name) at that, but it all went fantastically well. Mat displayed his models in the dealers room. Jim eagerly threw himself into the programme; when he wasn't scheduled to be on a programme item, he was enthusiastically taking part in others as an audience member. And Jason maintained and bettered his reputation as a fan-friendly, approachable guest. Redemption '03 was held over the weekend of February 21-23 2003 at the Ashford Internation Hotel, in Ashford, Kent, UK. The guests were Chris Boucher, Damian London, Mike Collins and Tanith Lee. A great time was had by all, as Chris regained his belief in the human race, Damian revealed the secrets behind the Oscars, Mike felt part of a family (albeit a rather large and strange one), and Tanith demostrated her own fannishness. 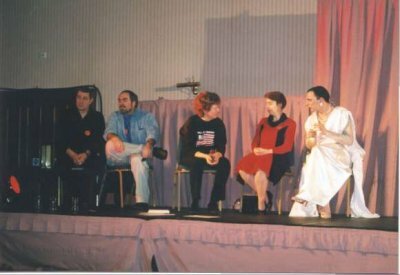 Redemption '01 was held over the weekend of February 23-25 2001 at the Ashford International Hotel, in Ashford, Kent, UK. The guests were Ron Thornton (unable to attend), Gareth Thomas, Andy Lane, Michael Sheard and David Walsh. Due to Ron being deluged with work, at the last moment Joe Nazarro and Sheelagh Wells gallantly stood in to help out. It was again a great success, the guests had a wonderful time (or if they didn't then they hid it very well! ), the attendees have been writing wonderful reviews, and the committee had so little sleep that they are doing it again <grin>, and our chosen charities received £1,200. Redemption '99 was held over the weekend of February 26-28 1999 at the Ashford International Hotel, in Ashford, Kent, UK. The guests were Brian Croucher, Joe Nazarro, Sheelagh Wells, Jane Killick and David Walsh. It too was a great success, the guests enjoyed their weekend, the convention members enjoyed the con, the committee were sufficiently happy that they did it again (see above), and our chosen charities received one thousand pounds each!